"The Department of Defense continues to carefully monitor China's military modernization efforts, including progress in developing its offensive missile force," he said. U.S. intelligence officials believe the DF-41 will eventually be outfitted with between three and ten warheads. It would be the first time China’s strategic missiles were outfitted with multiple, independently-targetable reentry vehicles, or MIRVs. Intelligence analysis of the recent DF-41 test indicated it carried a single dummy warhead, but U.S. officials believe that missile eventually will be tested with MIRVs. Chinese Defense Ministry spokesman Geng Yansheng told reporters the day of the latest missile test that recent tests were not targeted at any country. "We conducted some normal weapons tests within the territory recently," Geng said, according to the official Xinhua News Agency. "These tests have no specific targets and were not targeted at any specific countries." Geng made no mention of the DF-31A test that day. China is currently in the middle of a major strategic nuclear forces buildup that includes four new ICBMs – the DF-41, JL-2, DF-31A, and another road-mobile missile called the DF-31 that is assessed to have less range than the DF-31A. The DF-31A has been deployed since the mid-2000s and has an estimated range of 7,000 miles, enough to give China the capability of hitting Washington or European capitals in a nuclear strike. Richard Fisher, a specialist on China’s military with the International Assessment and Strategy Center, said China has deployed up to four DF-31A missile brigades. "Assuming that a brigade counts up to 12 mobile launchers and 12 missiles, this may amount to 48 DF-31A missiles, or multiples of 48 if the [People’s Liberation Army] plans reloads for this ICBM," Fisher said. Fisher said the DF-31A appears to be a single-warhead missile, but published photos of the warhead released in 2008 reveal that the warhead seems capable of rapid maneuvers and likely would use decoys to enhance its survivability from missile defenses. 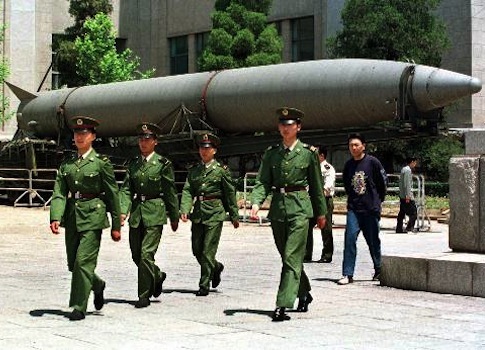 The DF-31A and its reload missile are likely stored in the 3,000 miles of tunnels used by the Second Artillery Corps, as China’s nuclear and conventional missile forces are called. The tunnels, first disclosed several years ago by China and later publicized by a Georgetown University arms control study, are large-scale facilities used to store missiles and warheads, as well as to protect underground nuclear production facilities. Fisher also said the DF-31A could be modified and used by China as part of its anti-satellite weapons program. "At the 2002 Zhuhai airshow, I was told that the DF-31A was the basis for the KT-2 solid-fueled space launch vehicle, at the time still under development," Fisher said. "The KT-1, based on the DF-21 medium range ballistic missile, was the basis for the SC-19 [anti-satellite] weapon demonstrated in January 2007," he added. The missile tests come as China has raised tensions in Asia by asserting territorial control over disputed islands in the South China Sea, where it recently set up a new military command to bolster its maritime claims. China is also at odds with Japan over the Senkaku islands, which Beijing claims as its territory. The uninhabited islands were recently the scenes of protests by Japanese and Chinese nationalists. The Pentagon has said that it will back Japan in defending the islands under a U.S.-Japan defense treaty. The string of flight tests also comes as Secretary of State Hillary Clinton is in Asia for visits to the Cook Islands, Indonesia, China, Timor-Leste, Brunei, and Russia’s Far East near Vladivostok. During a meeting at Rarotonga, Cook Islands, in the south Pacific with New Zealand’s Prime Minister John Key on Saturday, Clinton was asked about Asia’s concerns about China’s assertiveness. "Now here in the Pacific, we want to see China act in a fair and transparent way," she said during a news conference. "We want to see them play a positive role in navigation and maritime security issues." Pickart, the Pentagon spokesman, said the United States remains committed to seeking stable military-to-military relations with China and wants to see more openness on the part of the Chinese military. "We carefully monitor China's military developments and urge China to exhibit greater transparency regarding its capabilities and intentions," he said. "Military-to-military dialogues between the United States and China featuring open and substantive discussions between our armed forces will help us improve mutual understanding, build trust, and reduce the risk of misperception and miscalculations." The People’s Daily, the official newspaper of the Chinese Communist Party, also reported the same day of the DF-31A test that China’s strategic missile forces have fully transitioned from "troops in the mountains" to "troops on the wheel" during the past 10 years. The reports said the use of mobile missiles that use solid rather than liquid fuel had increased missile forces’ mobility and also increased the ability to evade satellite reconnaissance. "China's strategic missiles have grown from a single model to a big family of various short-range, medium-range, long-range, and intercontinental missiles," the report said, noting that "precision strike capabilities" also were greatly improved in recent years. This entry was posted in National Security and tagged China, Hillary Clinton, Missile Defense. Bookmark the permalink.